Ever since it started really feeling like summer my face has been super acting up. I mentioned yesterday about my bachelorette weekend celebration which was spent with a friend of mine who is a skin care expert. I told her my woes which are basically this: I wash my face with cleanser and it feels super tight, so I put on oil, serums, and moisturizers and then my face feels heavy and greasy and gross, so I wash it again and the cycle repeats. After this conversation she recommended switching up my cleanser in favor for something more soothing, gentle and non-stripping. 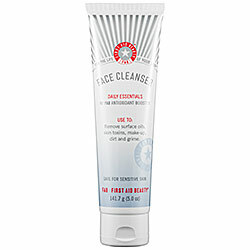 I’ve been using this cleanser for the last few days and so far its awesome. It totally removes the day–makeup, oil, dirt– without seriously stripping my face of the good stuff. My face never feels tight and I’ve had zero reactive breakouts. I’ve been using it in combination with this moisturizer and my skin is feeling normal and not overly greasy like it did when the summer first began. I know we are all so concerned with over washing, stripping and feeling clean in the summer, but seriously going in the other direction of moisture and gentleness has done wonders for my face.